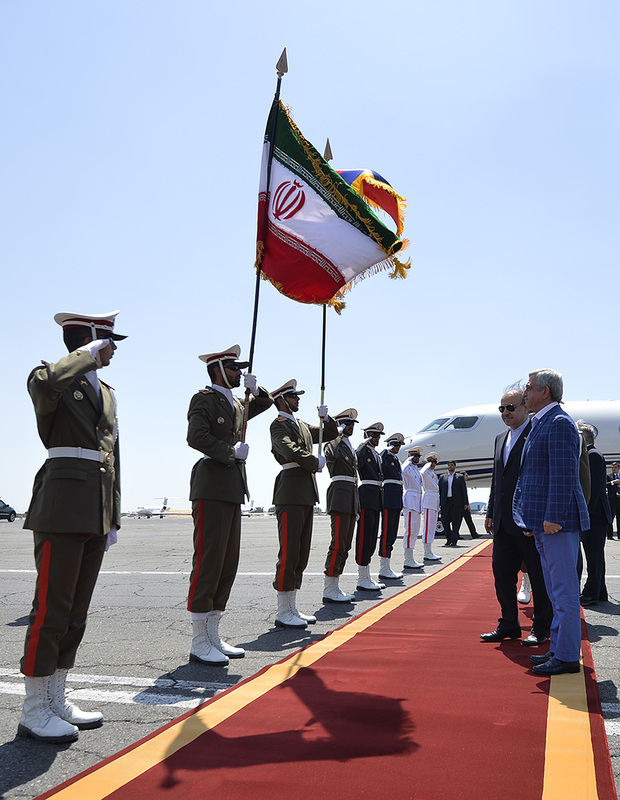 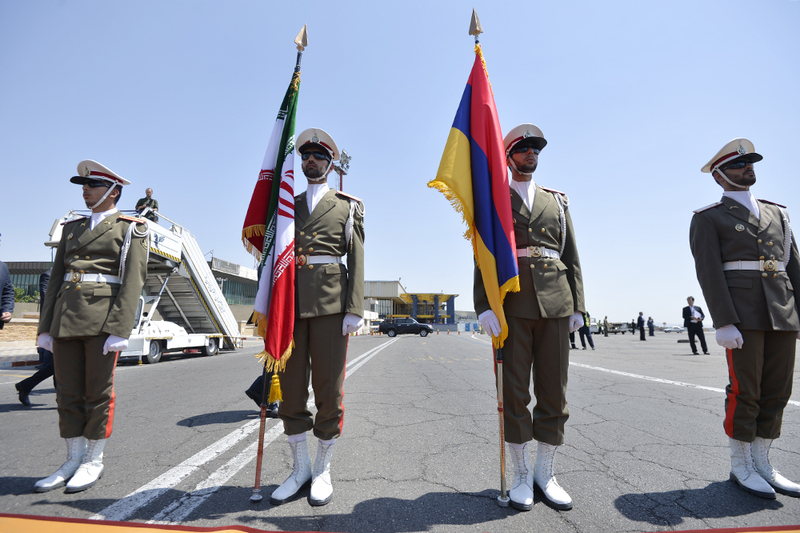 President Serzh Sargsyan arrived in the Islamic Republic of Iran on a working visit to attend the official inauguration ceremony of IRI President-elect Hassan Rouhani. 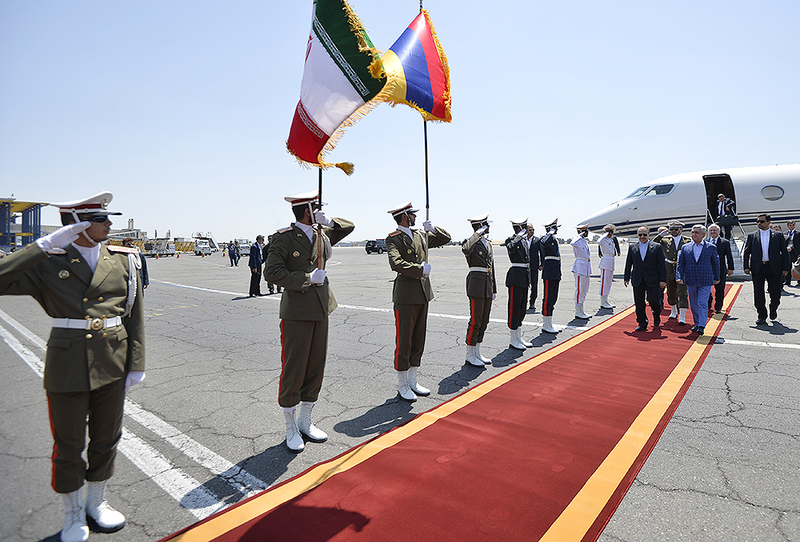 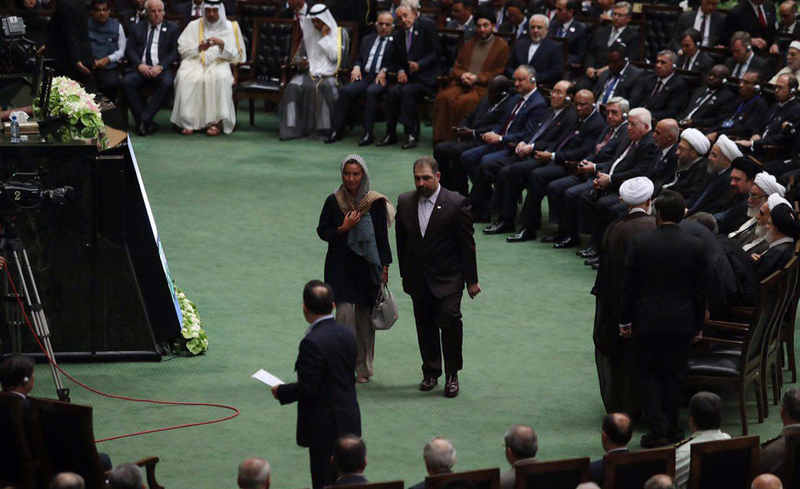 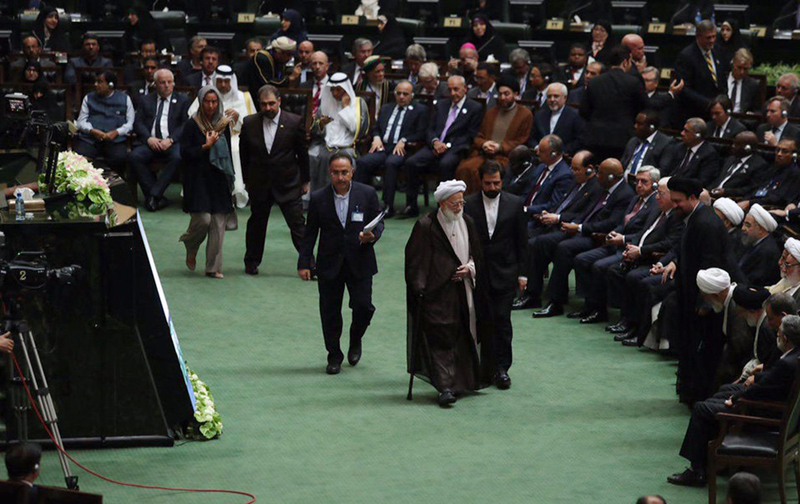 Later, President Rouhani will host an official reception in honor of the high-ranking delegations that have arrived in Tehran. 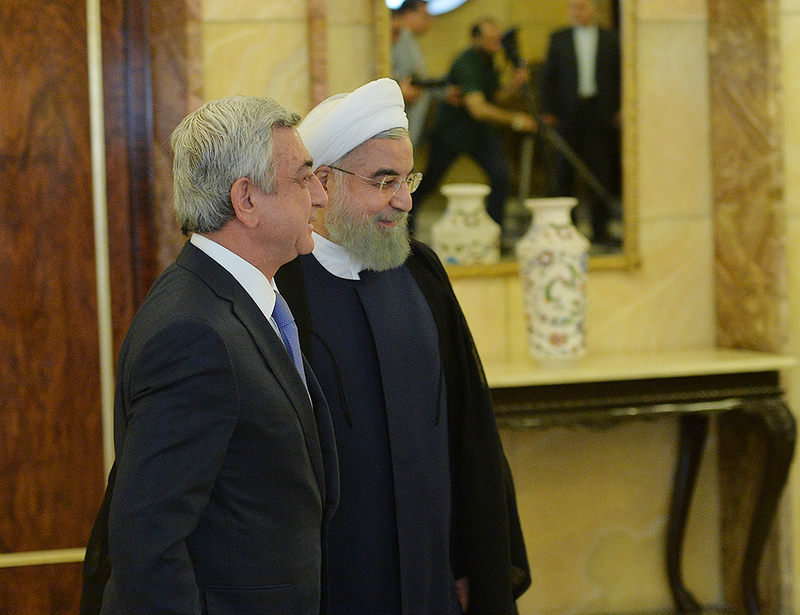 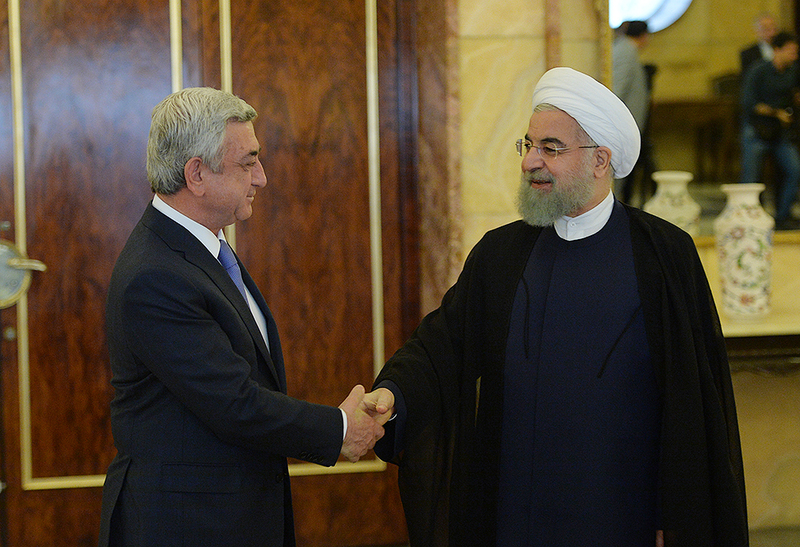 President Serzh Sargsyan, who is in Tehran on a working visit to attend the official swearing-in ceremony of IRI President-elect Hassan Rouhani, met with President Rouhani. 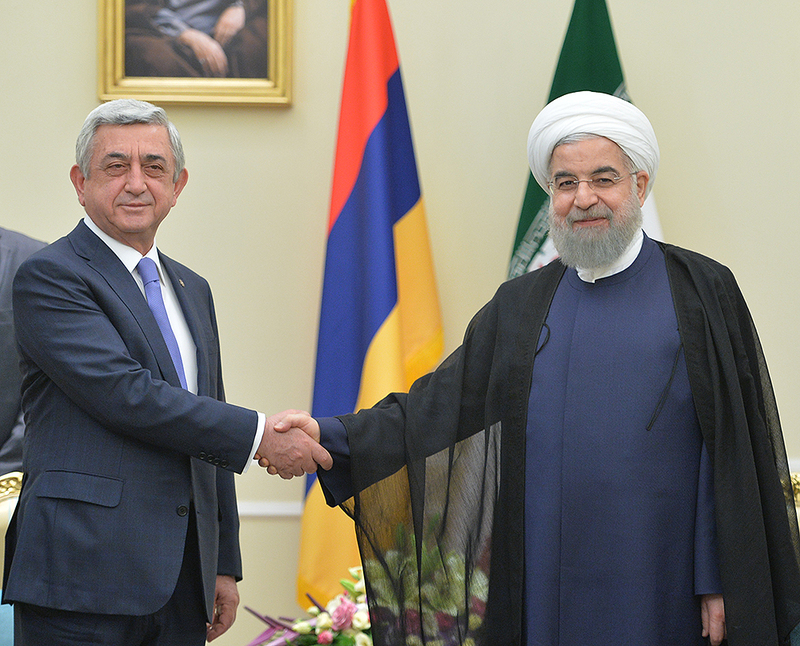 The President of Iran first thanked President Sargsyan for accepting the invitation and participating in the swearing-in ceremony and went on to stress that Iran highly appreciated the participation of the President of its good neighbor Armenia. 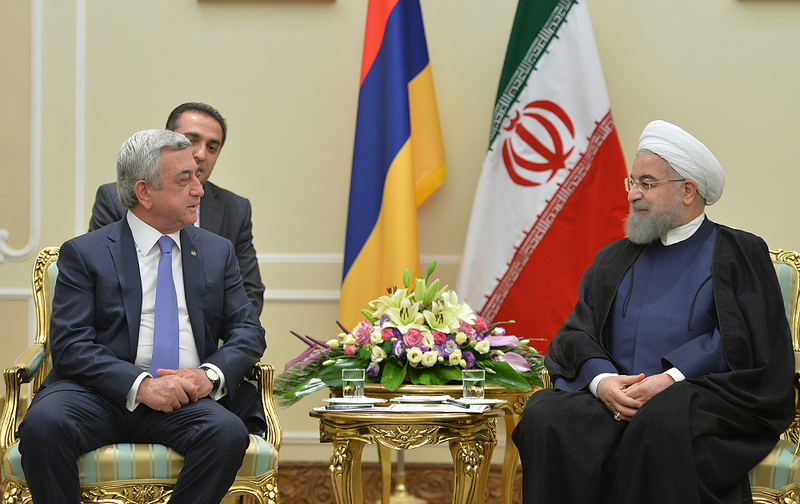 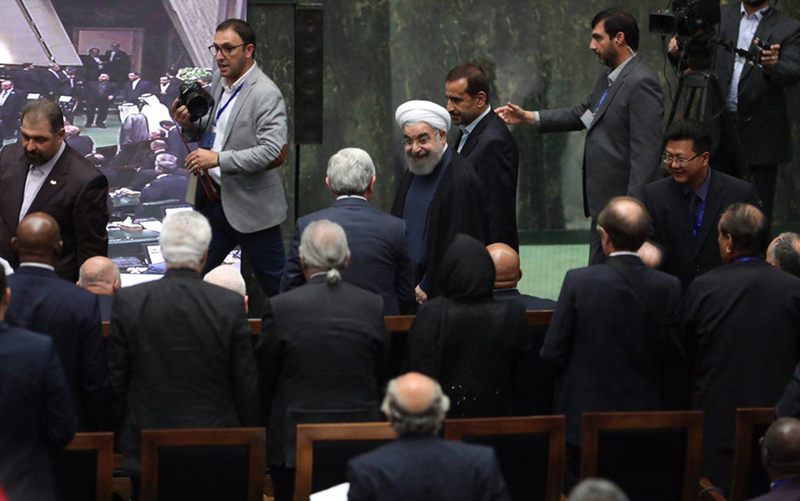 Hassan Rohani expressed the hope that the Armenian President’s visit would give new impetus to the development and expansion of bilateral relations, taking into account the historical and cultural affinities between the two nations. 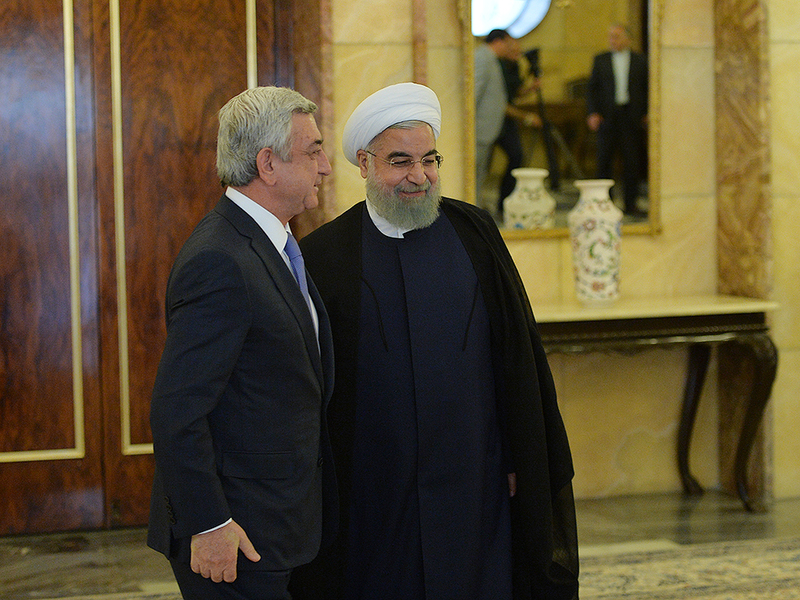 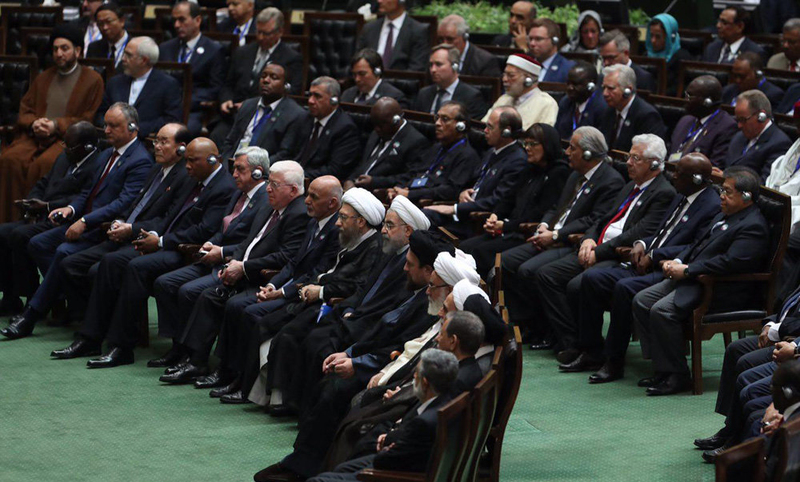 President Sargsyan noted that 2017 is a landmark year for both Armenia and Iran in terms of political events: Armenia held parliamentary elections according to the reformed Constitution, while the people of Iran elected the head of the executive authority; this year also marks the 25th anniversary of establishment of diplomatic relations between the Republic of Armenia and the Islamic Republic of Iran, which ushers in the modern era in the centuries-old historical ties. 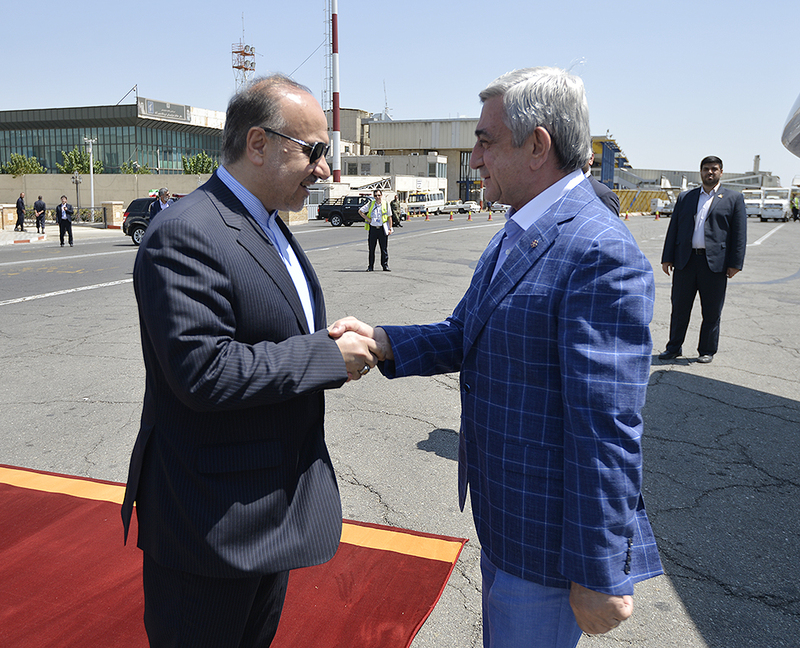 In this context, the Head of the Armenian State emphasized with satisfaction that the two countries were able to develop and strengthen mutually beneficial cooperation in all spheres of activity during this period. 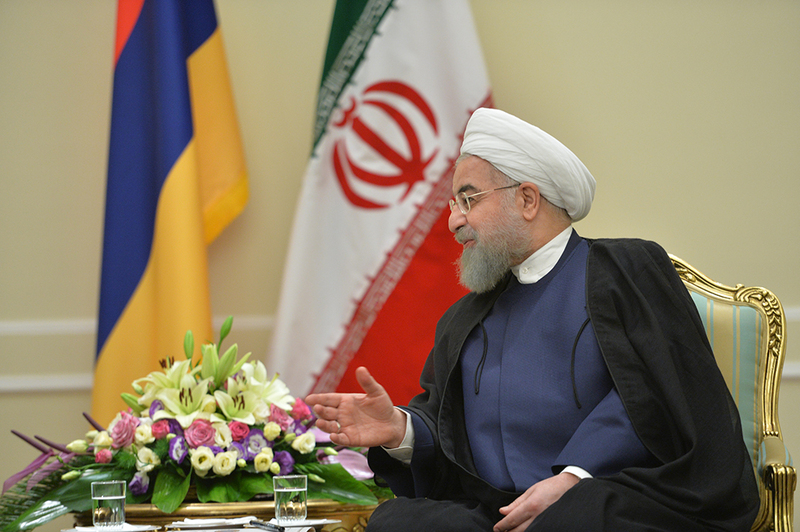 The two Heads of State took the opportunity to discuss a wide range of issues related to both bilateral and multilateral cooperation. 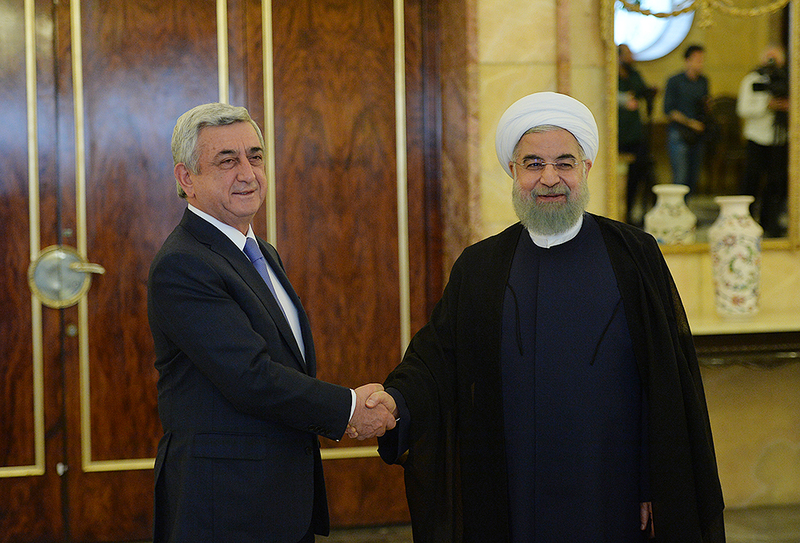 The parties concurred in that the Armenian-Iranian economic relations boast great development potential, which needs to be tapped through consistent efforts. 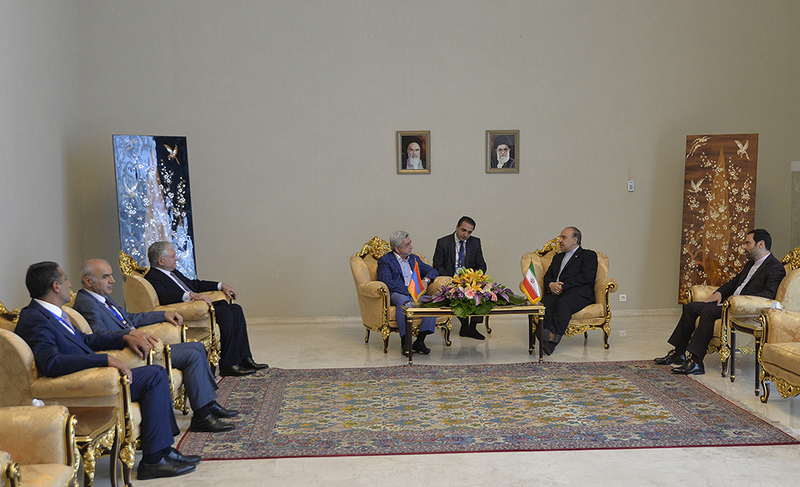 They expressed conviction that this will help boost bilateral trade turnover and step up mutual investments. 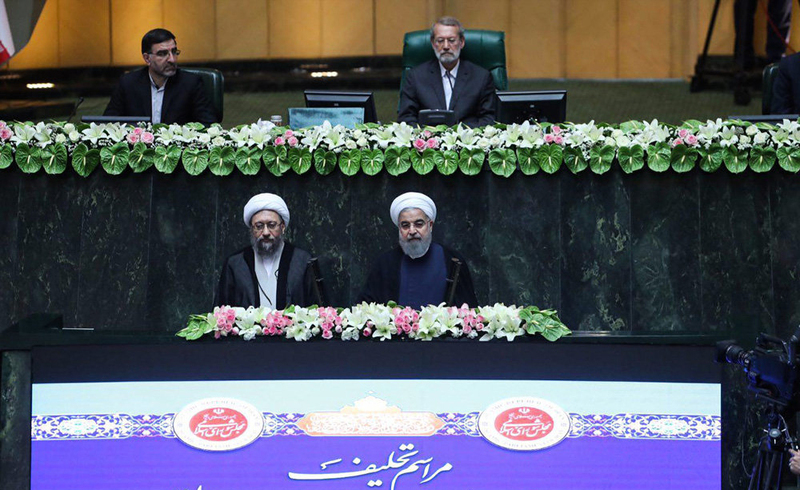 The Presidents stressed the importance of major projects underway in a number of sectors, as well as the implementation of new and promising programs. 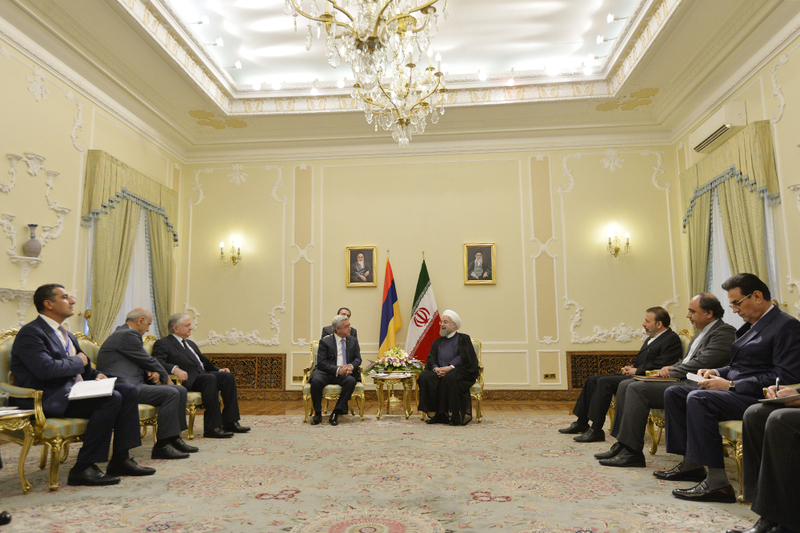 They highlighted the energy-related projects, in particular gas and electricity, as well as the importance of using international transport and transit routes linking the Persian Gulf and the Black Sea across the territories of Armenia and Iran. 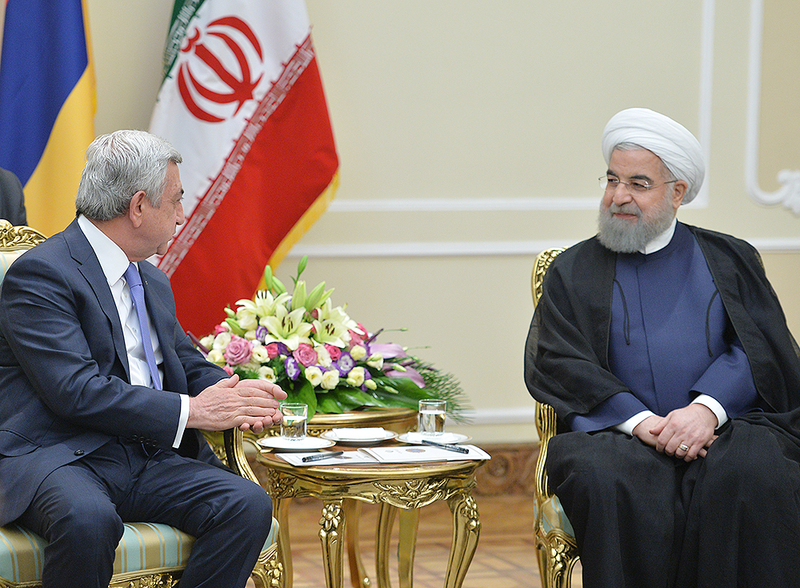 The importance of developing cooperation in the trilateral Iran-Armenia-Turkmenistan format was stressed on either side. 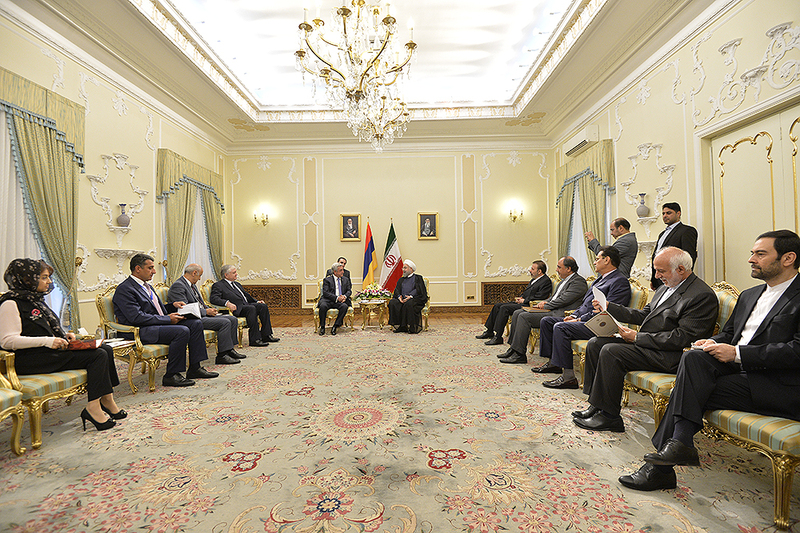 The sides stressed the importance of the ongoing talks between the Islamic Republic of Iran and the Eurasian Economic Union over the free trade agreement. 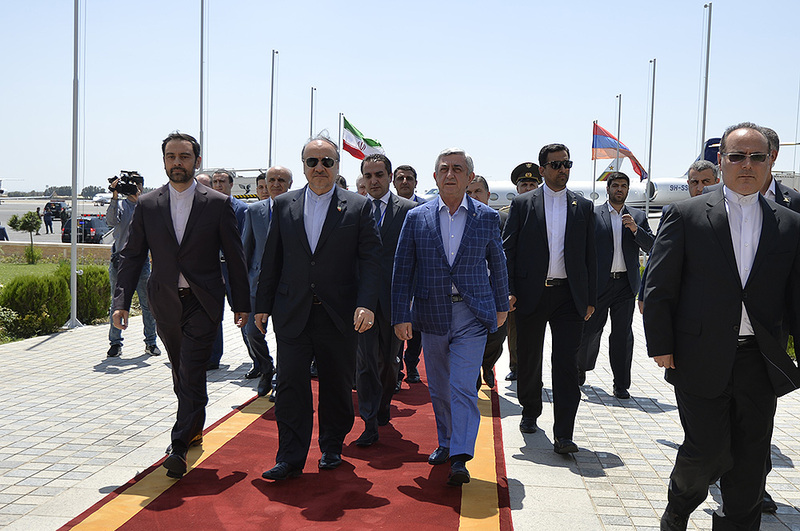 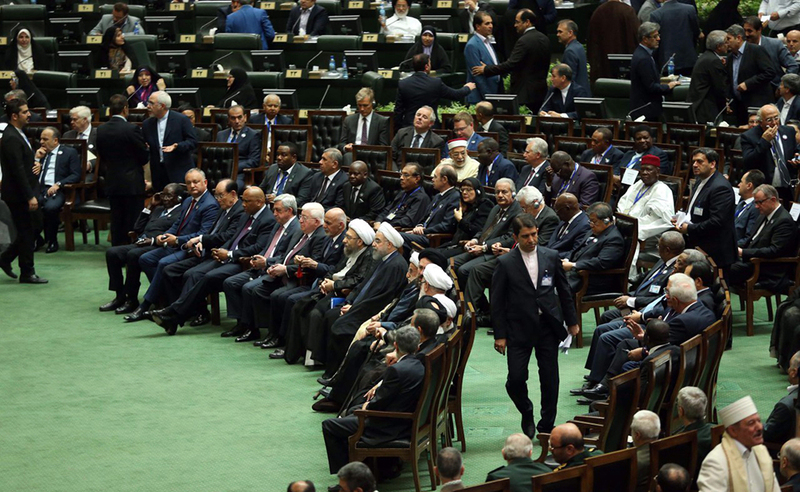 In this connection, the President of Iran pointed out that significant steps have been made in this direction, stressing that the signing of the agreement in the near future would be quite fruitful. 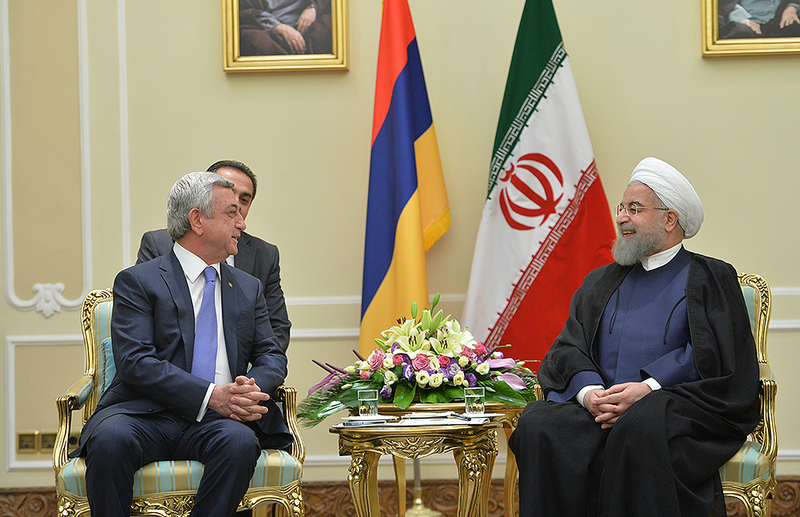 Hassan Rouhani appreciated Armenia’s initiative to waive the requirement of entry-exit visas, which was an important step from the perspective of expanding business ties, stimulating entrepreneurship, investment and tourism between the two countries. 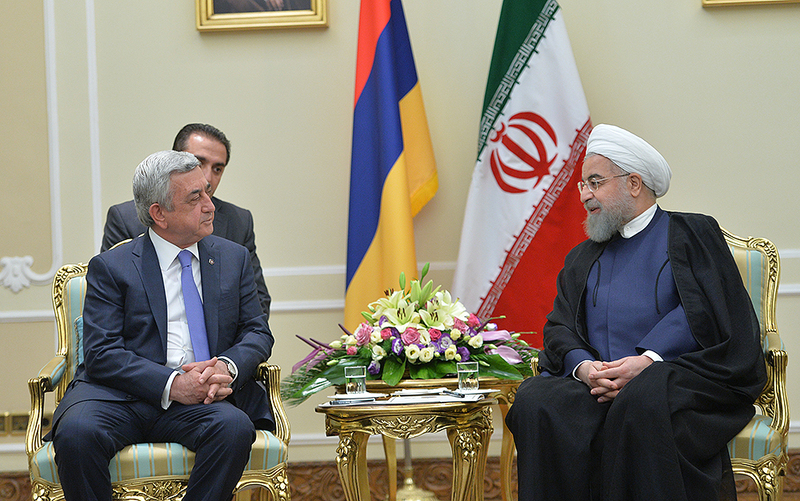 The meeting also touched upon regional security, including the settlement of the Nagorno-Karabakh conflict. 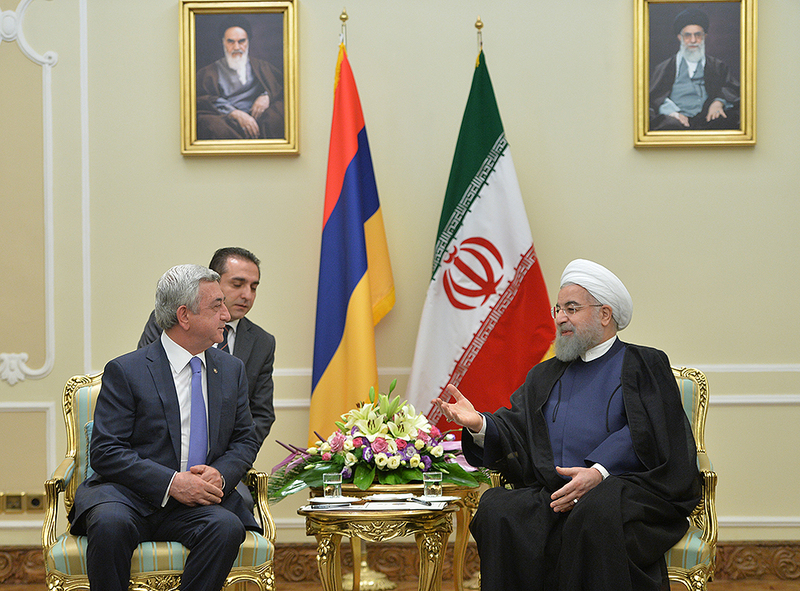 Presenting the current status of this process, President Serzh Sargsyan reaffirmed Armenia’s position, which implies negotiated peaceful settlement in the OSCE Minsk Group Co-Chairs format. 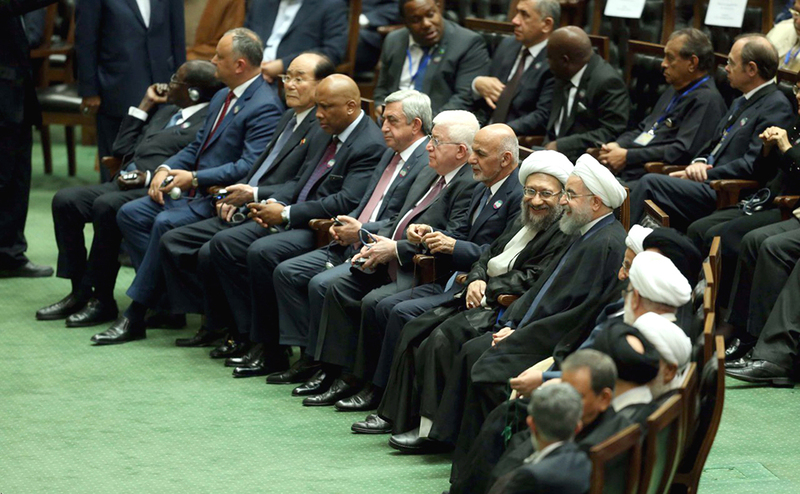 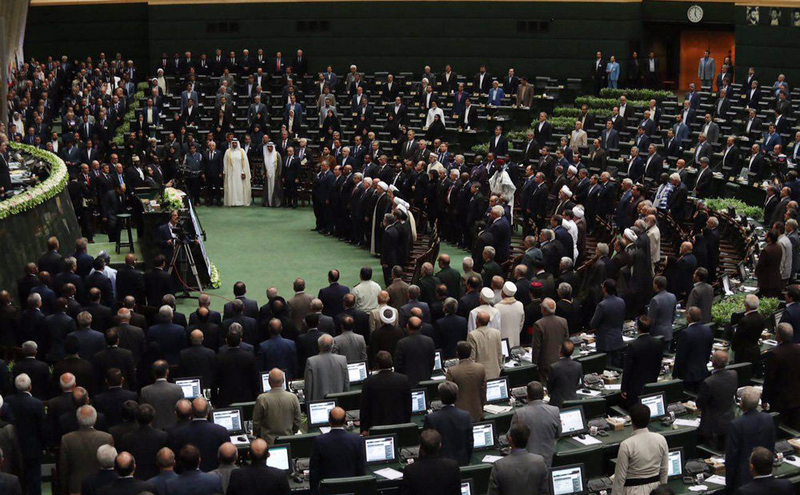 Noting that his country was an advocate of regional peace and stability, the President of Iran stressed that the NK conflict should be resolved exclusively through political means.